There are quite a few eccentric characters that have emerged from Sue Watson’s novels, and Gianni can easily be added to the list. He’s brash and he’s bold, loud and obnoxious. His hot-tempered manner sprinkled with egotism reminded me a little of Gordon Ramsey to the hilt, and you’ve got to wonder if Gianni is really that way in “real life”, or if it’s partially for show. If it’s what he thinks his audience would prefer, or if it goes even deeper than that. It seems only one woman can tame the wild beast of Gianni, and that would be Chloe. She doesn’t put up with his antics, in fact she’ll often add fuel to his already enraged fire, which makes for a smoldering, deep relationship between the two. There are so many layers to the both of them, and we get to see everything unravel, inch by inch, answering the question of, why? Why couldn’t they make it? The answer is deep, and tragic. Human. What I’ve always appreciated is Watson's ability to create characters who are real and experience real emotion, and handle everything in a way that any flawed human would. It’s messy and intense, but that’s usually the way it goes when we’re trying to deal. Thrown in there are moments of comedy and humor, the icebreakers that we all need in order to get on and get through this life. And of course, there is food. This wouldn’t be a Watson read without it. It’s funny that this go around intermixes a blend of deliciousness, with a few odd delicacies that Gianni whips up, only adding to his character and the tone of this story. No one in Snowflakes, Iced Cakes and Second Chances is perfect, but I can tell you, that’s one of the things I loved the most. It’s perfect in its imperfections, and the perfect holiday read for this time of year. 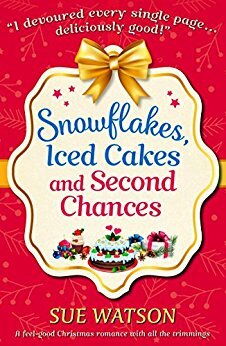 Book Review: Snowflakes, Iced Cakes, and Second Chances, to be honest, this book titles says a lot about the book and for me, it is a must buy one.